Don't let them slip by unnoticed!! A few weeks ago, a friend I know challenged those who read her blog and like to be critical of her life to try and put their stories out there. It got me thinking. I had never thought about writing my own blog but I decided to try. So over the last several weeks I have given it some serious thought. First, if I were to do such a thing what in the world would I blog about. So different ideas have come to mind from time to time but nothing ever stuck. Then I decided one day to just do it. Just jump in! I need to warn you I am not a writer. In fact, in school writing was the one subject I didn’t like much. So the challenge for me seems even greater than having to come up with ideas on what to write about. The challenge for me is to write with purpose and write interesting, well written blogs. So if you can be patient with my writing style, I will try my luck at blogging!! I welcome your thoughts, ideas, and yes even your criticism. As I was setting up my blog page I needed to come up with a title. That is when I decided what my blog was going to be about. The last several weeks have been extremely difficult for me. I have been battling a little depression (let’s say a lot of depression) and I wasn’t sure how I was going to get myself out of it. My sister suggested medication, my therapist told me to join an 8 week meditation course (not a suggestion – a must do), eating three meals a day and exercising three times a week. If you know me I am not much on medication even for a headache. To be completely honest with you after hearing all that my therapist wanted me to do I felt overwhelmed and exhausted and I hadn’t even started to try any of her suggestions. But through this difficult time I have just kept pushing myself to do the little things I needed to do in a day for myself and my family hoping that with time my life would get back on track. So I decided to push myself and start this blog. So I sat down at my computer and started to play with different names. The first few were already taken. I would not let that deter me from continuing. So I had to think harder, be more creative and that is when Small Moments in a Day came to mind. I realized that I have been trying really hard to notice the “small moments” in my day to try and help me find hope, encouragement, inspiration and to keep fighting the good fight. At the same time that I was trying to figure out my blog title and topic this “small moment” happened in my day and I knew what my first blog was going to be about. Read on if you want to find out more about it. And so here we are, my first official blog, “An Unexpected Surprise”. Last week I was over at a neighbors’ and I was admiring her side garden at her house. She has put a lot of time and energy into de-weeding, trimming, planting, and watering her garden. It looked really nice. I noticed this particular plant that she had. The flowers were a raspberry color. I love raspberries by the way! So I asked her what was the name of this plant and she couldn’t remember but I wanted to make a mental note of it so when I get the energy to start working on my gardens I wanted to be sure to pick one up. So we spent a few minutes talking about gardening, kids, life in general then I went home. It just happened to be her birthday. I felt bad that I didn’t know it was her birthday because I would have brought her something. Today, my neighbor’s husband stopped over and he brought me the plant that I so admired at their house. What an unexpected pleasant surprise!! He said that his wife wanted me to have it because I liked it so much at her house. Wasn’t that really nice of her? I so very much appreciated that she thought of me. I called her to personally thank her and she said it bothered her that she couldn’t remember the name of the plant when I asked her that day. 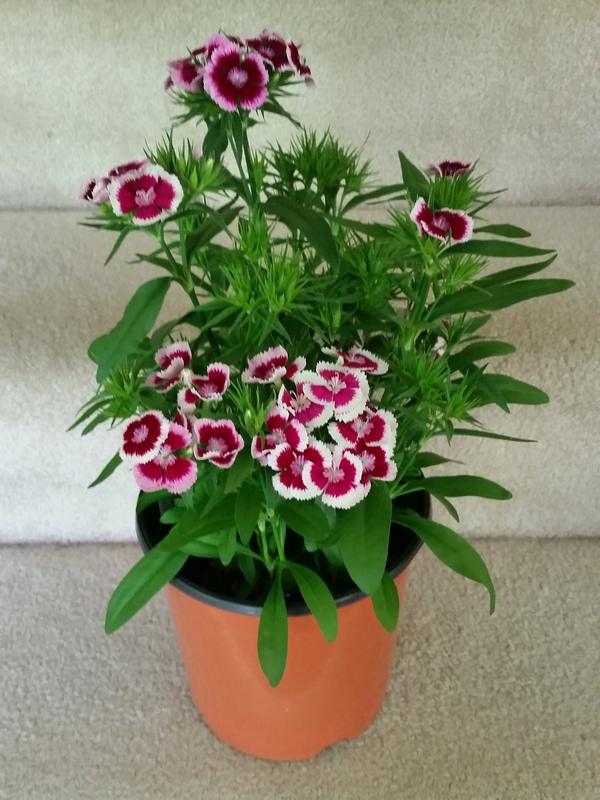 She went out to the nursery and came across it (Sweet William) and knew she had to get it for me. I told her she made my day. So I did it! I started blogging. It wasn’t as bad as I thought it was going to be. Try to take some time today and notice the “small moments” in your day. It is amazing how much they can help you out of your funk at least for a moment. If you feel comfortable sharing a “small moment” or two with me I would love to hear from you. Here’s to many “small moments ” in your day!! Life seems to be moving at incredible speed! It's hard some times to pause and appreciate the small moments in life but honestly they are the most precious ones. This entry was posted in depresssion, life, neighbors and tagged depression, encouragement, fighting the good fight little things, hope, inspiration, small moments, unexpected surprise. Bookmark the permalink. I think it’s a great idea to recognize one good thing each day that happens in your life and celebrate it! This is raw. It’s real. That’s the whole point of a blog. To have it be you. Turning my mess into a message.